This Friday's tournament featured a top swiss. 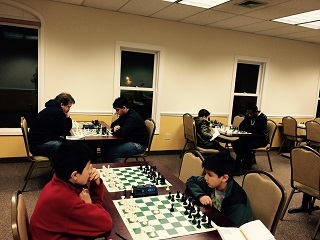 With over a 500 point rating advantage, Daniel Cooper was favored to win, which he did with a perfect 3/3 score. There was a 3-way tie for second place between Dicheng Wu, Carl Scovens, & Daryl Lavin with a 2/3 score. Tune in next Friday for more G/30 action!